The cocoanut [sic: 1922 spelling of "coconut"] pickers of the Phillipine Islands run up the trunks of the trees like monkeys. Their feet are as flexible as hands. Constantly exercising the muscles of their feet has made them grow strong and agile. When you wear Keds you allow the muscles of your feet to exercise and grow naturally. You will find that well developed foot muscles will make you much better in all games and sports. 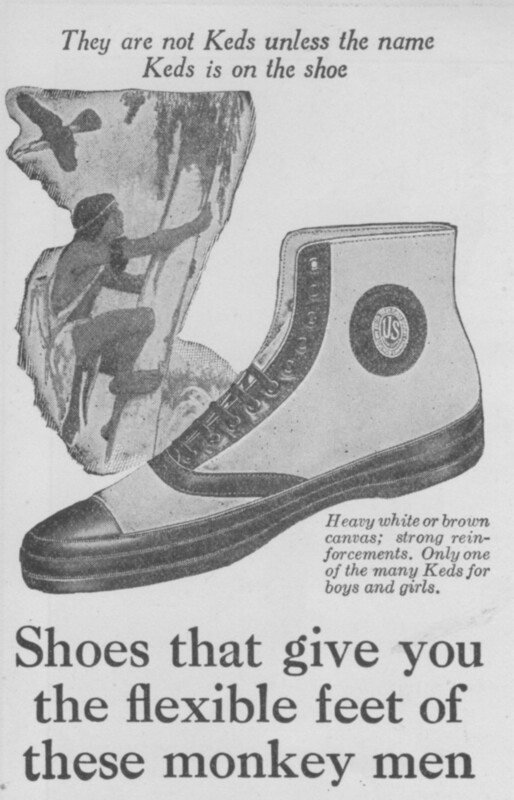 There are high Keds and low Keds, brown Keds and white Keds. The rubber soles are thick and strong enough for long wear, but light and springy enough for speed. The tops are of strong canvas, brown or white. Keds are made with corrugated soles, smooth soles or suction soles. You can get the kind you wish at your dealer's. If he hasn't them he will get them for you. But remember, Keds are made only by the United States Rubber Company, the largest and oldest rubber organization in the world. If the name Keds isn't on the shoes, they aren't real Keds. Booklet, "Camping," sent free if you write to Dept. D-2, 1790 Broadway, New York City.